At COBRA-Fit Miami, you’ll often hear Instructors shouting “GUARD UP!” in the midst of class. It’s an important part of our Tribe Culture. Guard Up is more than just a reminder to keep your hands up during your training. It’s a reminder to stay alert and while keeping your guard up is part of your physical training (it’s not easy keeping your guard up when you’re huffing and puffing), it’s more about your mental training. Everyone understands the need for physical exercise to keep fit and healthful, however, we believe your mental attitude is the most important pre-requisite for getting in shape and maintaining it long-term. Without the mental discipline, once stormy weather hits, and it always hits, you’ll just quit. That’s why sooo many people start off strong in January, start dwindling in March, and by June about 80% quit. Their minds convince them it’s too hard. 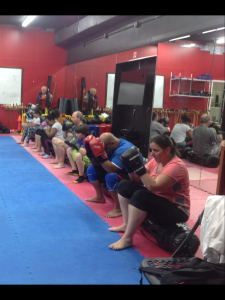 During our COBRA-Fit kickboxing sessions, you challenge your body only to the extent your physical capacity allows. You are competing only against yourself. When you’re physically challenged and feel like giving up, you’ll hear: “GUARD UP!! !” By raising your guard again, you’re training yourself, like a fighter, to stay in the fight. Your mind will want to give up prematurely, Guard Up, allows you to rest if you must, but never give up. If you never quit, you will succeed. Guaranteed. Can you see how you see how GUARD UP applies to life’s daily challenges? That’s why we train at COBRA-Fit Miami. It’s so much more than mindless exercise or even a workout. It’s a group of like-minded individuals and a caring staff, supporting each other and training to never give up and attain what’s truly important in our lives. Sound like a culture you want to be a part of? To experience the Tribe, CALL: 800-289-8188 for a No-Cost session. You Can Make It Happen In 2016!